As per the latest comprehensive and insightful research report released by Transparency Market Research, the United States industrial gas regulator market is highly fragmented. However, there are a few well-established brand names such as The Linde Group, Honeywell, and Air LIquide S.A. that are making their presence felt in the U.S. industrial gas regulator market. These players enjoy a significant market share owing to their forward and backward integration in the ecosystem by providing integrated and turnkey solutions across various industries. Moreover, these players have deeply penetrated the United States industrial gas regulator market by introducing innovative and technologically advanced products in the market, such as hybrid single-stage regulators for reduced complexity in industries to control the flow of gas. 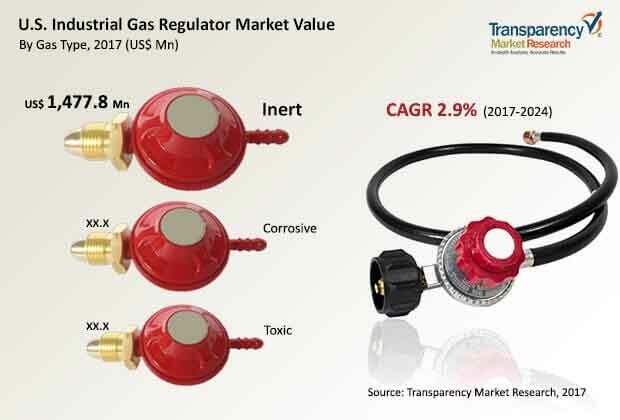 Others companies, such as Air Products and Chemicals Inc., Itron, Inc., and Praxair Technology, Inc. are the emerging players in the United States industrial gas regulator market and have positioned themselves well in the market. As per the available projections given in this research report, the U.S. industrial gas regulator market was valued at US$ 2,468.4 Mn in 2017 and is slated to reach a valuation of US$ 3,030.5 Mn in 2024, reflecting a CAGR of 2.9% during the assessment period 2017-2024. A growing demand for innovative products that offer improved performance and reliability and reduce environmental impact are driving the demand for new technologies and contributing to the growth of the United States industrial gas regulator market. Improvements in gas regulator technologies are anticipated to set new standards in performance of the industrial gas regulators by replacing the diaphragm used in the ordinary regulators with pistons in order to enable them to operate at an increased frequency, and also offer reliability and improved pressure stability, and these developments are driving the industrial gas regulator market in the United States. For example, Linde Group launched a hybrid premium regulators named Smoothflo. Such kind of regulators provide multi-stage performance and constant gas flow without any adjustments and provide enhanced safety as well. The impact of technologically advanced gas regulators on the industrial gas regulator market in the United States is expected to be high, as industries demand advanced technology products for better performance, enhanced safety and reduced redundancy of work. In the United States, gas processing equipment is witnessing increasing applications across the automotive industry in various manufacturing processes. These include the modern-day use of Oxyfuel-based welding and cutting in automotive manufacturing processes. Moreover, the growing popularity of gas powered automobile is anticipated to deliver a newfound growth prospect for industrial gas regulators across the automobile industry. These include gas regulators for the pressure indictors of the tanks of compressed natural gas (CNG) and liquefied petroleum gas (LPG) that are used as alternative fuels to power automobiles. In addition, there are huge growth prospects for industrial gas regulators across cyclic automotive industry in the areas of tire air inflation and refilling machinery. This growth can be attributed to the cyclic nature of automotive industry sales economics. These are the factors responsible for the growth of United States industrial gas regulator market in the automotive sector especially.